In the comparatively short history of social media, Barnes & Noble College has been an early and proficient adapter. Becoming a leader in the campus online conversation has become an important differentiator for a company keenly aware of the influence social media has with its Millennial customer base. Through engagement with more than 4.6 million students, Barnes & Noble College uses social media channels to communicate everything from product information, charitable and fund-raising initiatives to the latest fashions and trending news. Unlike many national brands who may have had trepidations about entering the social realm, Barnes & Noble College was prepared for its social debut three years ago, as Consumer & New Media Marketing Manager, Tamara Vostok, recalls. “We recognized the importance and impact of social media and felt we were prepared to take it on, so our initial focus was to launch a Facebook presence, because it was where students were really engaging and spending the most time,” she says. Part of that readiness was because Vostok envisaged a specific objective to their online presence. “Although we saw the importance of a national brand page, the real value in Facebook came from creating fan pages for each of our bookstores,” she explains. “Our students need access to customer service at all times, and Facebook offered another opportunity for them to connect with the best people to provide that – the booksellers and store managers on their own campuses,” she adds. 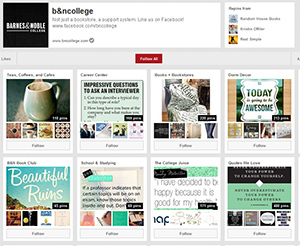 Barnes & Noble College Pinterest page, a pinboard-style photo-sharing website that allows users to create and manage theme-based image collections such as events, interests, and hobbies. Another social feature many brands are finding valuable is crowdsourcing, where products and services can be tweaked with input directly from customers. “It’s such a great opportunity as long as it’s actionable, and we’ll respond quickly to whatever our customers are commenting on. We always want to show that we’re listening,” she says. Another platform that illustrates that desire for engagement resulted in the student-oriented blog, The College Juice. “We created our blog because we felt that students are continually hit with advertisements, so we wanted to give them access to more substantial and exclusive content,” Vostok points out. That’s not to say there isn’t a commercial opportunity on The College Juice. “If we talk about college style for example, we can tie those kinds of topics into products they can take advantage of in the store,” she adds. Rather than dissuade their students from tweeting and constantly updating their Facebook status, college faculty are also embracing social media. “It’s interesting to see how many of our faculty are using it as part of the curriculum,” she notes, pointing out that professors are increasingly using Twitter as another avenue for students to submit questions and discuss lectures. A thorny problem with social media is that it can sometimes be capricious, and that the fashions that influence it can change. It’s a point Vostok concedes. “There’s always going to be something else – the next new thing, but we take the view that if it’s not relevant to our students and you don’t have a valid strategy of how to use a platform, you probably shouldn’t be participating,” she says. And having a strategy is key in the social realm. Pointing to Instagram, Vostok notes that the company uses the platform in a uniquely different way. “We’re not the content creators for Instagram, instead we use it as a showcase to feature images our students have produced and that’s a really exciting way to become involved,” she says. For all the excitement that still surrounds new opportunities from social media, Vostok can be pragmatic when it comes to reaching her student audience. “Even for Millennials, nothing’s going to beat the face to face in-store experience we can provide,” she says.